These words are of great relief to Jesus, His dear mother, and hopefully to all of us. “It is finished.” Jesus’ suffering had come to an end. His “thirst” was quenched by sour wine, a symbol of fallen humanity entering His very body. He had entered into all suffering, both interiorly and exteriorly, and now He was ready to enter into death itself. He spoke His final words and handed over His spirit to the Father. As our Blessed Mother looked on, heard her Son speak His final words, and breathe His last, she would have felt a sense of relief. Jesus’ long mission of salvation had been accomplished. Death was destroyed and now she only had to wait for His Resurrection. Our Blessed Mother knew this was not the end. She knew that her Son would rise. He had taught many times “that the Son of Man must suffer greatly and be rejected by the elders, the chief priests, and the scribes, and be killed, and rise after three days” (Mark 8:31). Though the Apostles and other disciples did not understand this teaching, our Blessed Mother did. She witnessed His rejection, His death, and now turned her eyes toward His promised Resurrection. This passage also states that Jesus “handed over His spirit.” His life was not taken from Him. His death was a free choice by which He gave Himself over to death. He chose to enter into the ultimate effect of sin, death itself, so as to redeem death and make it the door to eternal life. The destruction of death was accomplished by God, the source of life, subsuming it into Himself. God wanted to come close to us by becoming man. He came so close to us that He allowed man to do Him violence. But the last chapter of Christ’s life was yet to be written. His entrance into new life was about to begin. These words of Jesus must take on great significance in our own lives. We must see ourselves standing by the Cross with our Blessed Mother and hear Jesus speak these words to us, personally. We must allow our Lord to look into our souls and say to us, “It is finished.” Jesus speaks these words to each one of us. He says, “Your salvation is accomplished. My death has destroyed your own eternal death. My final word of victory has been spoken.” As we ponder this sacred scene and hear these final words, we must seek to allow them to transform our very lives. Reflect, today, upon whether you are attentive to these words of our Lord in your own life. Do you allow Him to apply His saving Sacrifice to your sins? Have you internalized this statement of promise from our Lord? Have you allowed the finality of His death to unite with your own sin? Reflect upon these three little words, this day, and allow the handing over of our Lord’s Spirit to take hold of you and transform your life. My dearest Mother, as you gazed intently at your Son, you heard Him announce that He had accomplished His mission. It was finished. He was faithful to the end. And though your heart was filled with sorrow as He died before your eyes, your spirit once again rejoiced as you witnessed the gift of salvation being accomplished for all humanity. 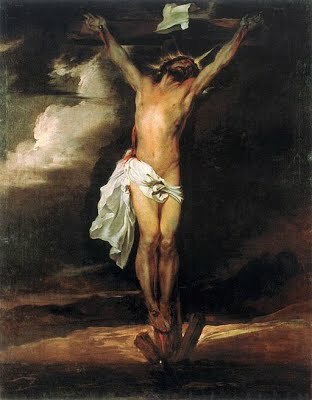 My saving Lord, from the Cross You announced the fulfillment of Your divine mission. You proclaimed that You had destroyed death itself by the free offering of Your life. Help me to listen to You speak these words to my heart and to be open to the unfathomable gift of new life accomplished by Your willing Sacrifice.